Spread the word about your organisation's celebrations, training, important meetings and more. Spread the word across your Intranet about exciting organisational events such as celebrations, training or important meetings. Allow employees to interact with the events, adding queries or confirming attendance. Share upcoming events with Invotra Events, include contacts, venues and links to any external booking forms. Invotra Events engages your users with commenting, rating and follow options. 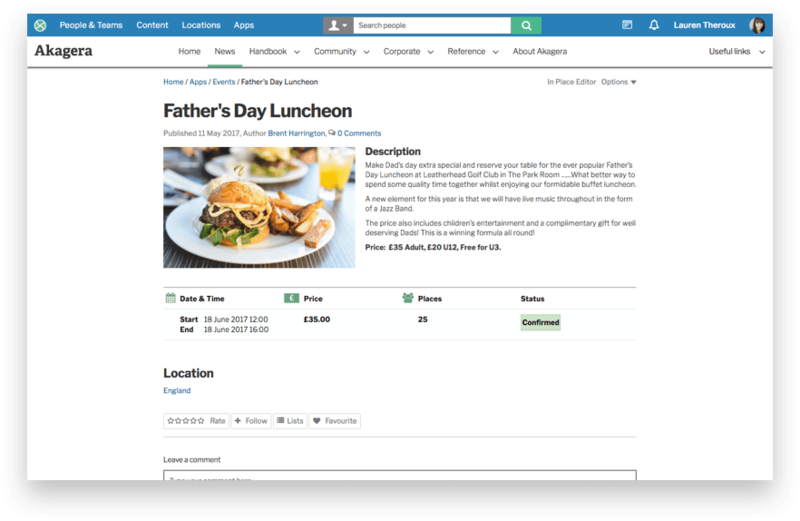 And publishing options such as tagging and targeting make sure the event is seen by the relevant audience. 1.Wide ranging fields to ensure all event details can be included. 2. Events can be commented on, replied to and rated or liked. 3. Contact details and locations can be displayed as links so that the event organiser can be directly contacted. 4. Updates can be made easily and notifications sent to users. 5. Tagging and targeting available to ensure the event reaches the target audience.